A few weeks ago, news that the Central European University located in Budapest, Hungary had come under threat spread like wildfire around the BCB campus. Hungary’s Prime Minister, Viktor Orban, had launched a legislative attack on the institution, indirectly calling for it to close down. 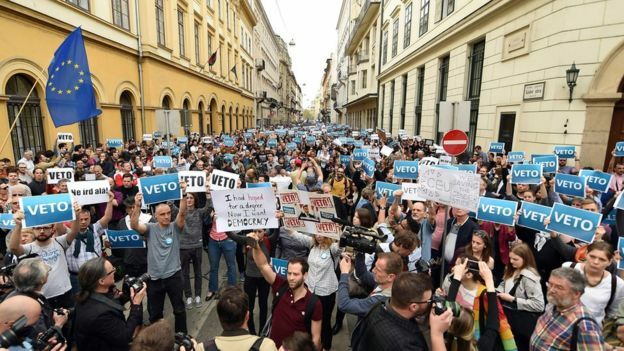 When pressured for a reason, Orban’s government claimed that the legal measures they had taken were only to protect the affairs of higher education in the country. However, the proposal underlined many prospects that seemed to single out CEU, including complex conditions it was required to meet to remain in existence. One such demand was that Hungary would have to sign an intergovernmental pact with the home country of the university, meaning that CEU’s associations with other universities would become highly politicised as Hungary would be obliged to have political ties with the countries that set up shop in their nation. Another demand was that foreign universities could only exist provided they had a campus in their home land, something that CEU doesn’t have as it is a cross-border institution. Orban’s government also seemed to be opposed to the issuance of double degrees (i.e., Hungarian and American) by the university, which many American universities operating outside the United States do, including Bard College Berlin! Bottom line: Orban wants CEU gone. What does this mean for academic freedom? Nothing good, I’m afraid. Many countries have recently elected hardliners into government who are extremely focused on nation building, and academic freedom will be the first democratic pillar to come under fire. Why? I never thought I would use this phrase seriously, but because the pen truly is mightier than the sword. Academics are respected today in a way that (most) politicians are not. You may argue that this is because many of today’s politicians are infamously incompetent pigs (I have many other words I would rather use, but not today). It’s a tragic state of affairs when some populations around the world can’t trust the very people that run their country to keep them safe. Take Turkey for example: April 16th proved to be their very own D-day as citizens voted to extend Erdogan’s powers as acting president and abolish the position of Prime Minister. If Erdogan was a tyrant before, he now has center stage while the leaders of the free world are being forced to watch his unprecedented attack on Western democracy. Any guesses as to who will be the first to go under the dictat-ahem, I mean Erdogan’s new rule? That’s right: The academics. In fact, Early Modern Science’s guest lecturer Jens Reich informed us in his lecture on Tuesday that Turkish schools were no longer required to learn about evolutionary theory under Erdogan’s rule. That is, Erdogan believes that learning facts should not be compulsory — interesting and baffling at the same time. Two months ago, we had a Turkish scholar visit our school as a guest speaker for the Scholars at Risk class. The former assistant professor at the Istanbul Commerce University (whose name will not be disclosed for purposes of protecting the speaker), was fired after signing the Academics for Peace petition in 2016. The petition was signed by multiple academics demanding an end to the violence against the Kurds in Turkey. His arrest takes place in the context of a nationwide shutdown of academic freedom. He explained to us how the political turbulence in Turkey was treating its academics and how its approach to academic freedom would have a strong negative impact on Turkey’s future diplomatic relations. Towards the end of his speech, he looked around at our hopeful, naive faces as though pitying the world we were being catapulted into and uttered five simple words: “We’re heading into a war.” He predicted that if Turkish citizens voted ‘Yes’ on the referendum (heads-up: they did), this would be a big crack in the ice for the country’s relations with Western nations and, more importantly, for democracy. Who knew that he would be right? But the attack on academic freedom is not new — nowhere near, in fact! Academics have long faced persecution in countries with mostly non-democratic regimes. The UAE recently convicted a popular Emirati economist, Nasser bin Ghaith, for tweets that were allegedly “anti-regime” and accused him of seeking to engage in “hostile” activity by criticising Egypt, an ally of the UAE. BCB’s Scholars at Risk course is devoted to furthering knowledge of the history and intricate ethics of human rights activism and to also engage in such activism. The course, led by Kerry Bystrom in Berlin and Tom Keenan in USA, is divided between Bard’s Berlin and Annandale campuses. BCB is currently working on multiple action plans to specifically petition the Emirati government for bin Ghaith’s release and adequate medical care; the Bard Annandale campus is currently advocating for Abduljalil al-Singace, a Bahraini engineering professor whose writings on democracy and human rights earned him a life sentence at fearsome Jau prison in Bahrain. Nasser bin Ghaith’s case has been ongoing since April 2011 when he was imprisoned for “publicly insulting” the government when he called for “democratic and economic reforms”. He was pardoned and released from prison. He was then arrested again in 2015 without warning or reason. Bin Ghaith was beaten and thrown into prison while the prosecutors scrambled to piece together evidence against him. Eventually it turned out that this huge petroleum exporting nation had a problem with this one man’s Twitter account. His tweets (which primarily concerned the price of petroleum) were scrutinised, and some were picked out as “anti-regime” and found to “publicly humiliate” not just the UAE government but the Egyptian one too! I like to call this “dissent by tweet.” If they’re arresting people based on Twitter accounts, it begs the question of what these countries would make of Donald Trump. It’s important to remember that the case against bin Ghaith has more or less been made on account of his internet personality and his alleged but highly unlikely connection to the Ummah terrorist party. As an economist, you would think they’d let this man express his academic opinion in peace because, at the end of the day, their economic fate is in the hands of the likes of him, but the UAE apparently likes to gamble. They have turned innocent tweets about economic and political structure into cause for imprisonment. Nowhere has he verbally been open about his criticism of the government, but obviously the Emirati government believes that 140 Twitter characters are enough to classify someone an enemy of the state. Nasser bin Ghaith’s case was picked up by many international NGOs including Scholars at Risk after which the Bard and BCB course is named and with which they are working closely. It’s easy to see how this is a case of human rights abuse and a clear infringement upon academic freedom. Bin Ghaith’s arrest, Turkey’s referendum, threats to CEU’s existence are examples of the fear that many countries feel towards academia. They are threatened by the pen, so they fight with the sword. CEU is one amongst many academic bodies that have come under fire for ridiculous and grotesque reasons. But the fight to keep academic freedom alive and kicking is one that we must all be a part of. Fortunately CEU has received worldwide attention and support, and has even been backed up by governmental organisations. Orban’s threat will not go ignored by the international body. Let’s not forget that, as students, we represent a potential for real change, and part of this change means actively engaging with and informing ourselves about issues such as these and seeking justice no matter what.